One-Eyed Dragon's Armor: Kabuto is a Head Armor in Nioh. 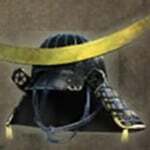 "A sturdy helmet with a sinewy appearance, it features a "shikoro" neck guard and wing-like flaps known as "fukikaeshi." The sharp crescent moon is titled at an angle so as not to get in the wearer's way when they swing their sword. Part of a traditional armor set known as Tosei-gusoku in Japanese, this armor was favoured by Date Masamune, a feudal lord who ruled over Oshu (present-day Tohoku region). It was created by Myochin, a famous armorer from Kamakura in Sagami province (present-day Kanagawa prefecture). Despite losing an eye to illness as a child, Masamune became the head of his clan at a young age; his aggressive territorial expansion earning him the name "The One-Eyed Dragon." Clad entirely in black, his Yukinoshita-style armor was said to have captivated even his enemies"